The screw pump is commonly attributed to Archimedes, on the occasion of his visit to Egypt. This tradition may reflect only that the apparatus was unknown to the Greeks before Hellenistic times and was introduced in Archimedes's lifetime by unknown engineers. Depictions of Greek and Roman water screws show them being powered by a human treading on the outer casing to turn the entire apparatus as one piece, which would require that the casing be rigidly attached to the screw. Some researchers have postulated this as being the device used to irrigate the Hanging Gardens of Babylon, one of the Seven Wonders of the Ancient World. A cuneiform inscription of Assyrian King Sennacherib (704–681 BC) has been interpreted by Stephanie Dalley to describe casting water screws in bronze some 350 years earlier. This is consistent with classical author Strabo, who describes the Hanging Gardens as irrigated by screws. German engineer Konrad Kyeser equipped the Archimedes screw with a crank mechanism in his Bellifortis (1405). This mechanism quickly replaced the ancient practice of working the pipe by treading. The Archimedes screw consists of a screw (a helical surface surrounding a central cylindrical shaft) inside a hollow pipe. The screw is usually turned by windmill, manual labor, cattle, or by modern means, such as a motor. As the shaft turns the bottom end scoops up a volume of water. This water is then pushed up the tube by the rotating helicoid until it pours out from the top of the tube. The contact surface between the screw and the pipe does not need to be perfectly watertight, as long as the amount of water being scooped with each turn is large compared to the amount of water leaking out of each section of the screw per turn. If water from one section leaks into the next lower one, it will be transferred upwards by the next segment of the screw. In some designs, the screw is fused to the casing and they both rotate together, instead of the screw turning within a stationary casing. The screw could be sealed to the casing with pitch resin or other adhesive, or the screw and casing could be cast together as a single piece in bronze. The design of the everyday Greek and Roman water screw, in contrast to the heavy bronze device of Sennacherib, with its problematic drive chains, has a powerful simplicity. A double or triple helix was built of wood strips (or occasionally bronze sheeting) around a heavy wooden pole. A cylinder was built around the helices using long, narrow boards fastened to their periphery and waterproofed with pitch. The screw was used predominately for the transport of water to irrigation systems and for dewatering mines or other low-lying areas. It was used for draining land that was underneath the sea in the Netherlands and other places in the creation of polders. Archimedes screws are used in sewage treatment plants because they cope well with varying rates of flow and with suspended solids. An auger in a snow blower or grain elevator is essentially an Archimedes screw. Many forms of axial flow pump basically contain an Archimedes screw. 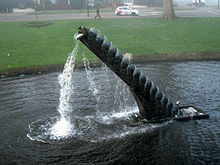 The principle is also found in pescalators, which are Archimedes screws designed to lift fish safely from ponds and transport them to another location. This technology is used primarily at fish hatcheries, where it is desirable to minimize the physical handling of fish. An Archimedes screw was used in the successful 2001 stabilization of the Leaning Tower of Pisa. Small amounts of subsoil saturated by groundwater removed from far below the north side of the tower, and the weight of the tower itself corrected the lean. Archimedes screws are also used in chocolate fountains. A screw conveyor is an Archimedes screw contained within a tube and turned by a motor so as to deliver material from one end of the conveyor to the other. It is particularly suitable for transport of granular materials such as plastic granules used in injection molding, and cereal grains. It may also be used to transport liquids. In industrial control applications the conveyor may be used as a rotary feeder or variable rate feeder to deliver a measured rate or quantity of material into a process. A variant of the Archimedes screw can also be found in some injection molding machines, die casting machines and extrusion of plastics, which employ a screw of decreasing pitch to compress and melt the material. It is also used in a rotary-screw air compressor. On a much larger scale, Archimedes's screws of decreasing pitch are used for the compaction of waste material. If water is fed into the top of an Archimedes screw, it will force the screw to rotate. The rotating shaft can then be used to drive an electric generator. Such an installation has the same benefits as using the screw for pumping: the ability to handle very dirty water and widely varying rates of flow at high efficiency. Settle Hydro and Torrs Hydro are two reverse screw micro hydro schemes operating in England. The screw works well as a generator at low heads, commonly found in English rivers, including the Thames, powering Windsor Castle. In 2017, the first reverse screw hydropower in the United States opened in Meriden, Connecticut. The Meriden project was built and is operated by New England Hydropower having a nameplate capacity of 193 kW and a capacity factor of approximately 55% over a 5-year running period. SS Archimedes – the first steamship driven by a screw propeller. ^ a b Dalley, Stephanie; Oleson, John Peter (2003). "Sennacherib, Archimedes, and the Water Screw: The Context of Invention in the Ancient World". Technology and Culture. 44 (1): 1–26. doi:10.1353/tech.2003.0011. ^ BBC. "Windsor Castle water turbine installed on River Thames" bbc.com, 20 September 2011. Retrieved: 19 October 2017. ^ HLADKY, GREGORY B. "Archimedes Screw Being Used To Generate Power At Meriden Dam". courant.com. Retrieved 2017-08-01. ^ "Meriden power plant uses Archimedes Screw Turbine". Retrieved 2017-08-01. Wikisource has the text of the 1911 Encyclopædia Britannica article Archimedes, Screw of. The Turn of the Screw: Optimal Design of an Archimedes Screw, by Chris Rorres, PhD. "Archimedean Screw" by Sándor Kabai, Wolfram Demonstrations Project, 2007.